It’s dangerous to leave so many government positions vacant. We’re starting to see why. 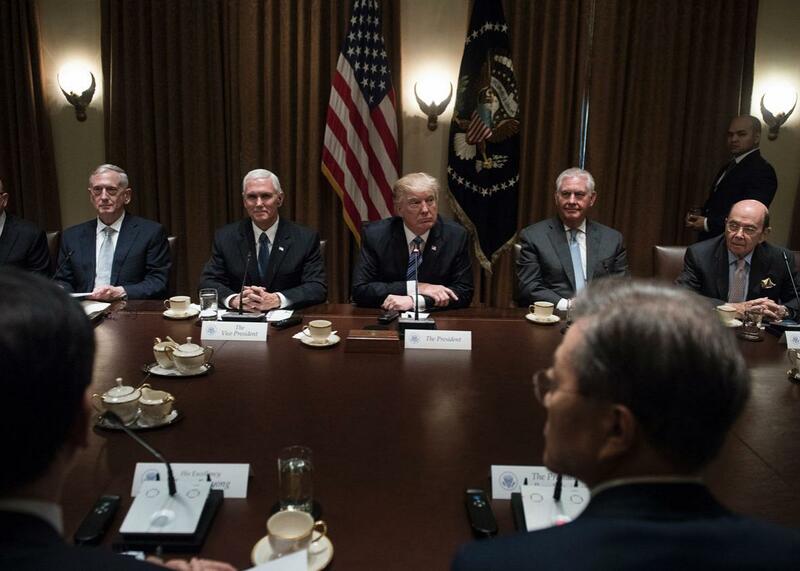 President Trump holds a meeting in the Cabinet Room of the White House on June 30. On Tuesday morning, President Trump confirmed what some have long suspected: His failure to fill hundreds of senior and midlevel slots throughout the government isn’t an oversight; it’s deliberate. And thus Trump proved once again that he has no idea what federal departments and agencies do—or what they need in order to function. He may think that by denuding the government he’s “draining the swamp” (as he said on the campaign trail) or carrying out the “deconstruction of the administrative state” (as Steve Bannon once put it). * But in fact, he’s losing the very people he needs to do his and the country’s business. Of 591 key personnel positions requiring Senate confirmation, Trump has nominated only 225. (By comparison, by mid-August of his first term, Obama had nominated 425.) Some of these positions probably aren’t so important, but many of them are. For instance, of the six slots for undersecretary of state, he has nominated only one. Of the 22 assistant secretaries of state, he has nominated just three. Across the river, in the Pentagon, he has nominated only two of three undersecretaries of defense (though the one slot unfilled is undersecretary for policy) and just four of 12 assistant secretaries of defense. Failing to fill these posts can’t be justified as an exercise in efficiency; it’s an abdication of diplomacy and a diminution of American power. Secretary of State Rex Tillerson and Secretary of Defense James Mattis have personally traveled to East Asia and other trouble spots, to reassure shaky allies of America’s commitment to their security. But diplomacy merely begins with such high-level trips. The crucial business takes place among the midlevel officials, who prepare the agenda for their bosses before a summit and follow up on it afterward. The problem is, the United States has no midlevel officials right now. When foreign officials want to talk with an American, they often don’t know whom to call. Yes, there are acting assistant secretaries in those slots, and there are staffs in the embassies. (Trump fired all the incumbent ambassadors upon taking office and has since replaced only a handful.) Many of these people are competent, even expert. But they tend to be foreign service officers, civil service employees, or, in a few cases, holdovers from the Obama administration. The Trump White House doesn’t trust them, nor do their counterparts in foreign countries view them as emissaries of the current president. They are, at most, placeholders and, in many cases, less than that—especially at the State Department, where Tillerson evinces little interest in their views. If the standoff with North Korea is to be settled peacefully, those midlevel officials will have to do the bulk of the work—before, during, and especially after the diplomatic overtures. If the United States wants to play a serious role in that settlement, it would be good if we had those officials in place. Even Laura Ingraham understands that. Donald Trump, by his own admission, does not.